Beyond the edge of darkness, there is a world of sword and sorcery! BUYSOUNDTRAX Records presents the original soundtrack to HAWK THE SLAYER, featuring music composed by Harry Robertson aka Harry Robinson (TWINS OF EVIL, THE VAMPIRE LOVERS, LUST FOR A VAMPIRE) for the 1980 sword and sorcery classic directed by Terry Marcel, written by Marcel and Robertson and starring John Terry (THE LIVING DAYLIGHTS, LOST, E.R. ), Jack Palance, Bernard Bresslaw (KRULL, CARRY ON series), Ray Charleson (EMPIRE OF THE SUN, UNITED 93), Peter O’Farrell (CROSSED SWORDS, LEGEND), W. Morgan Sheppard (THE KEEP, SHOGUN, GARGOYLES), Patricia Quinn (I, CLAUDIUS, SHOCK TREATMENT), Harry Andrews, Shane Briant and Roy Kinnear. HAWK THE SLAYER tells the story of two brothers, Voltan (Palance) and Hawk (Terry), who are locked in a bitter blood feud that is ignited when Voltan kills their father after he refuses to turn over a magic Elven mindstone and then proceeds to kill Hawk’s bride. Before dying, their father gives Hawk a sword with a pommel shaped like a human hand and the hand comes to life, gripping the Elven mindstone and giving it magical powers and the ability to respond to Hawk’s mental commands. Hawk vows to avenge his father and sets out to find his brother and kill him. On his journey to hunt Voltan, Hawk meets Ranulf (Sheppard), who has been engaged by the High Abbot (Andrews) to find someone to help rescue the Abbess of a remote convent, who has recently been kidnapped by Voltan and is being held for ransom. Hawk enlists the aid of his old friends to help mount a rescue: Gort (Bresslaw), a dour giant who wields a mallet; Crow (Charleson), an elf of few words armed with a deadly bow and Baldin (Peter O’Farrell), a wisecracking dwarf. During their rescue attempt, Hawk kills Drogo (Briant), son of Voltan, and they are forced to withdraw. Enraged, Voltan chases the heroic band to the convent for a final confrontation with his brother. Released in 1980, HAWK THE SLAYER is one of the first modern sword-and-sorcery films, predating DRAGONSLAYER by one year and CONAN THE BARBARIAN by two years. Strongly influenced by the science fiction and fantasy writing of Jack Vance, producers Terry Marcel and Harry Robertson set out to make a sword-and-sorcery film in the style of Akira Kurosawa and SEVEN SAMURAI. All the sword fighting would be choreographed kendo-style. In addition to working behind the camera on the film, Robertson also took on the task of scoring the film also. Known as Harry Robinson for most of his career, thanks to an accounting mistake, Robertson was well known for his association with Hammer Films in the early 1970s, scoring Hammer classics like TWINS OF EVIL, THE VAMPIRE LOVERS, LUST FOR A VAMPIRE and COUNTESS DRACULA, providing a distincting musical signature that fit those films like a glove and help to solidify their identities as Hammer Films. 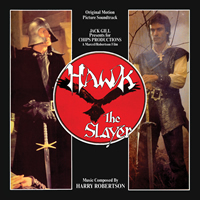 For HAWK THE SLAYER, Robertson chose to write a bright and modern score, infusing a traditional orchestra heavy on strings and brass with synthesizers and electric guitar, with plenty of nods to the composer’s own favorites: Bernard Herrmann, Jerry Goldsmith, Quincy Jones, Ennio Morricone, John Barry. While the aesthetic of the film was to emulate Kurosawa in terms of camera angles and direction, Robertson thought of the film as a Fantasy Western while he was scoring it. BUYSOUNDTRAX Records presents the world premiere compact disc release of HAWK THE SLAYER, featuring music composed by Harry Robertson, mastered by James Nelson at Digital Outland. The booklet contains liner notes written by noted author Randall D. Larson. In addition to the original album program of HAWK THE SLAYER, we have included a new performance of the classic theme by composer Dominik Hauser. HAWK THE SLAYER is a limited edition release of 1000 units.